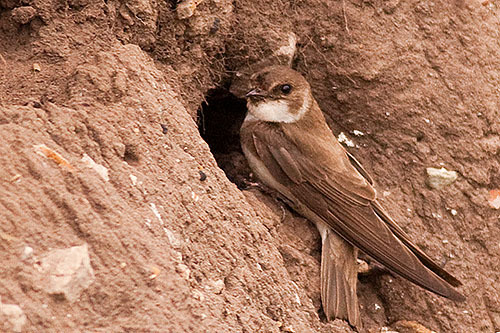 The smallest of the Swallows and Martins / with a brown breast band across a white underpart and no white spots in the tail . Summer visitors from Northern Africa / march - october . Diet of small airborne insects / feeding mainly over water / Nests colonially in holes excavated in sand and gravel banks / the holes can be up to 100cm in length / the nest chamber is lined with plant material and feathers / both parents take turns incubating the eggs and feeding the young / Clutch of 4-5 eggs , Incubation 14 days , Fledge 20 days , Number of Broods 1 - 2 .